The chances are that while growing up, you’ve played the classic game of dodgeball at least one time. While the exact rules of the game may change, the overall core concept stays the same. Pick up a ball and try to hit your opponent with that ball to eliminate them all while avoiding your enemies trying to take you out. In middle school, the core fundamentals required players to stand behind a line and throw balls from afar. This proved a little tasking for those who aren’t as physically capable of whipping a ball across 12 feet. Other versions grant you the ability to save eliminated teammates by shooting a basket with the ball or catching a ball. 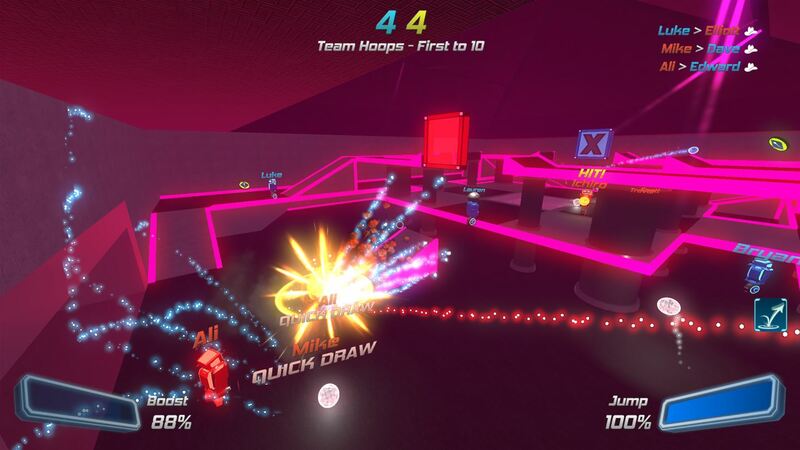 Disco Dodgeball Remix takes all the core fundamentals and brings them together as one. Developed by Zen Studios, Disco Dodgeball Remix takes every great thing you may or may not know about Dodgeball and make it even better. Disco Dodgeball Remix does not have a story, but would you really expect a game that revolves around Dodgeball to have one? Eh, I guess the sport did get a movie. The arcade mode is the games main feature for the single-player experience. Featuring eight different levels that get progressively harder along with a boss that appears every two levels. Money is gained for kills and combos and can be used for upgrades and power-ups to enhance your characters abilities and keep you scaled with the opponent’s difficulty. All of this is available to you as you work your way up to becoming president of the galaxy. The single-player side features a few different modes. Training teaches you the basic techniques of the game. Bot Match mode allows you to hone your skills against bots of various difficulties on different levels and game modes. Finally, a challenge mode offers to truly test your abilities with an array of different trials for you to master. Alongside the single-player, the game does also feature local and online multiplayer. Core Modes – Thankfully, Disco Dodgeball Remix isn’t all about picking up a ball and eliminating opponents. The game does also feature a variety of different modes to help every game feel unique. 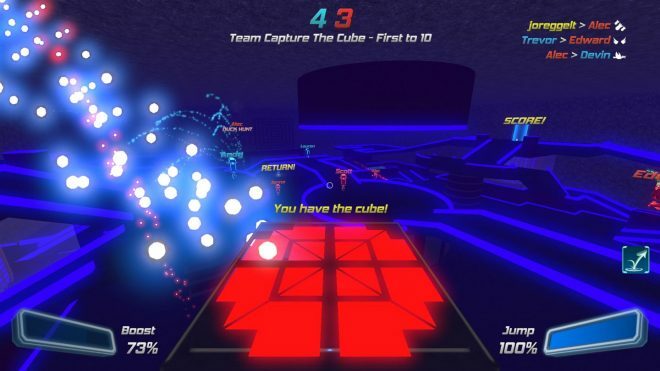 Some team-based modes include Team Capture the Cube, which is Disco Dodgeball Remix’s style of Capture the flag. Two teams face off to grab the cube from their opponent’s base and return it home all while defending their cube from being stolen. 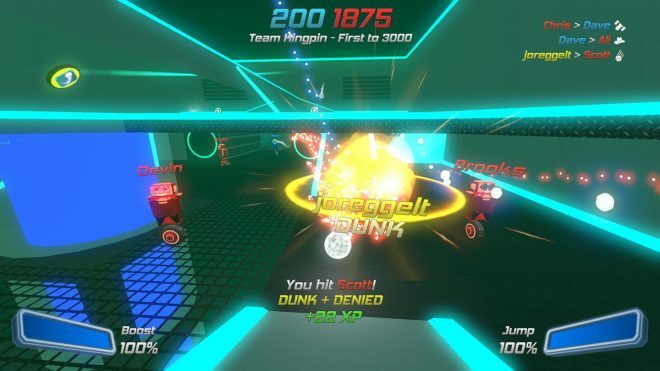 Team Hoops is a basketball style mode that asks a team to pick up a shiny colored dodgeball and shoot it into the square-shaped hoop above them. There are also a few different modes that turn the game into a free for all. Super Ball is a mode that asks a player to pick up and carry the glowing ball. The player continues to earn points as long as they hold the ball. The ball can be thrown at a player to temporarily kill them at the risk of losing the glowing ball. Kingpin is a mode that grants one player as the kingpin. This allows them to do various trick shots and combos. Other players must seek out the kingpin and eliminate him to be crowned the new kingpin. Power-Ups – Disco Dodgeball Remix does a great job of making the game simple for all players. Still, there are some players out there who aren’t the greatest and only play casually. Thankfully the game does offer a variety of different power-ups to assist even the most basic of players. For those who aren’t the greatest at aiming, the homing power-up allows players to lock onto an enemy before throwing a ball. Once thrown, depending on the distance the ball was thrown and the various obstacles between, the ball only has a chance of hitting its target. The power-up isn’t 100% accurate so it’s not overpowered by any means. The boomerang power-up allows a ball to return to the holder shortly after thrown. This power-up is unique for someone who defends an objective and doesn’t want to chase after their ball after every kill. The big ball power-up makes the significantly larger and makes for hitting a target much easier. The downside to this power-up is that it moves a bit slower than the normal size ball when thrown making it easier to catch. The ball also turns back to its neutral grey color faster making ricochet shots harder. These are only a few of the many different unique power-ups the game has available. Catching a ball – Really the only issue with the game is a small one at best. As a player, you have the ability to catch a ball thrown by an enemy. By doing so, this will cause the player who threw the ball to be eliminated. The idea behind catching a ball is easy. As the ball is coming towards you eventually a yellow glow will surround the ball. At this point, you are required to press the right trigger and it will allow you to catch the ball. The idea is pretty simple, it’s the execution that fails to follow through. In many cases when the ball is coming towards you, you’ll find pressing the right trigger doesn’t register the ball as a catch which causes you to still be hit. There are even times where you’ll find yourself catching a ball that wasn’t in direct line of sight. When looking towards the ball, you need to look as close to the center of the ball as possible to guarantee a catch. This is obviously not optimal when there’s a lot going on as it would require a lot of focus and accuracy to achieve. The only other alternative would be to forget about catching altogether unless you’re trying to complete a challenge. Disco Dodgeball Remix delivers on a true dodgeball experience. Whether you’re looking for the classic attack and defend style of gameplay or a unique team-based experience with a sports style added in, the game does feature something for all. The game offers a variety of different levels to play in. The size of the levels differs in size to keep every level feeling unique. The wide array of power-ups each have something for everyone. Each power-up feels useful in one way or another depending on the game mode. The techno-style music helps the game to feel upbeat and keep the player feeling pumped during a match. The bots offer a decent challenge even on the easiest setting and the local and online multiplayer allow for fun with friends and family. The game is great for what it offers from the start, though It would be interesting to see other modes and customization options added later on. Disco Dodgeball Remix is an easy game to just pick up and play and worth every penny. Just be sure to watch out for White Goodman. 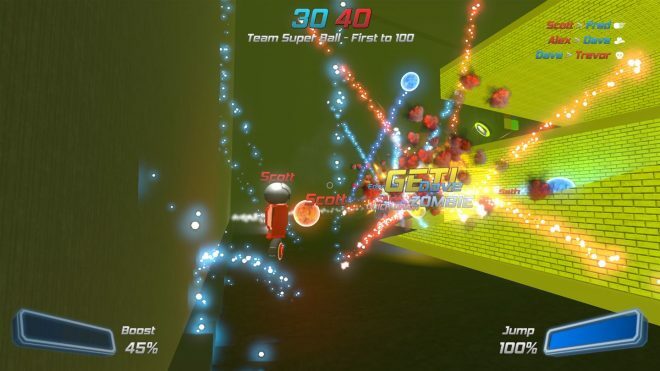 Disco Dodgeball Remix was developed and published by Zen Studios. The game released on May 22, 2018, for $14.99. A copy was provided for review purposes.